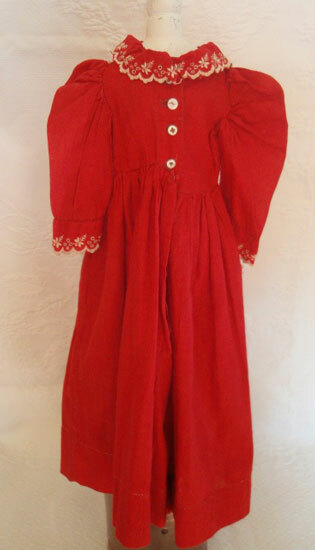 This is a charming late 19th C turkey red cotton doll dress that was also purchased out of the Sally Whittemore estate. 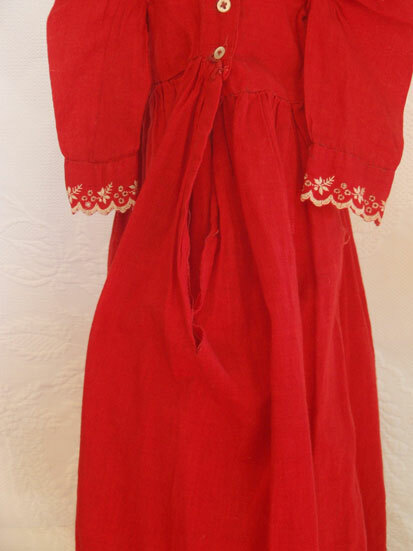 Measuring 18 ½ inches in length, 4 ½ inches shoulder to shoulder with a 6-inch waist, this dress is entirely hand-sewn with uneven stitching which leads me to believe a young girl made it. As you can see by the photo, the waist is slightly higher on one side than the other, but the overall length is not affected. 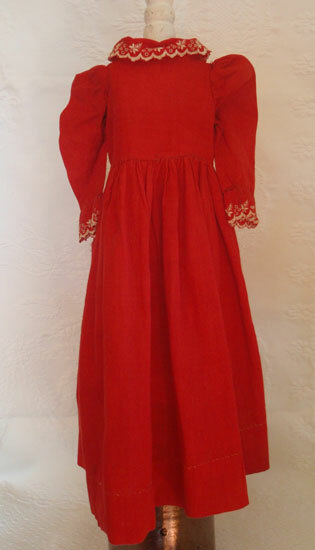 This appears to have been quite an ambitious project with the addition of the red eyelet lace at the cuffs and collar. 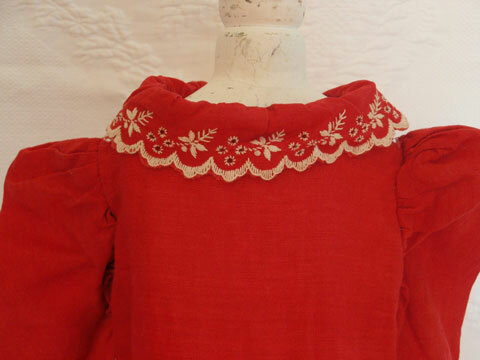 There are 4 white glass shirt-buttons of varying sizes finishing off the front (another reason I think this was a young girl’s creation). 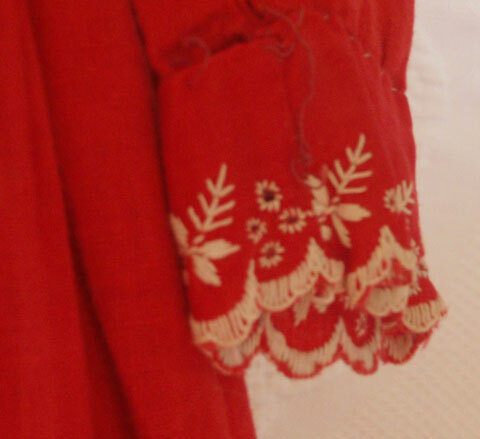 It is in very good condition with one small 1/8 inch hole in the side of the skirt as well as what I believe could be (although it could be the way it was fashioned) a two inch tear in the fabric at the bottom of the front opening (see photo). 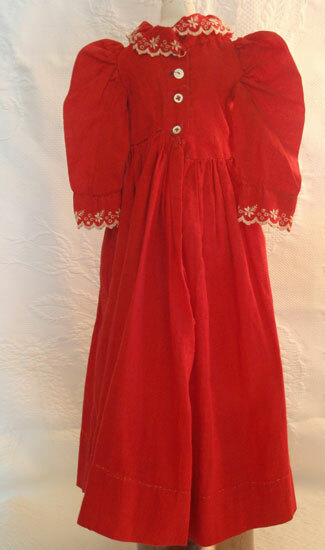 This does not detract, in fact it is not even seen when it is hung or on a doll. The charm and naïveté of this piece are simply wonderful. Sally had an eye for such things. 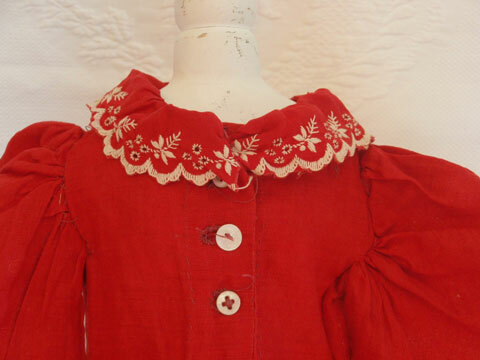 It looks great on a cloth doll or simply hanging on a small peg rack.